Skype’s Linux super nodes to help WP7? I’ve been musing on what Microsoft is doing with Skype and Windows Phone 7 lately. If you hadn’t heard, since its acquisition of Skype, Microsoft has replaced the use of public super nodes with a farm of hosted Linux servers fulfilling the same purpose. 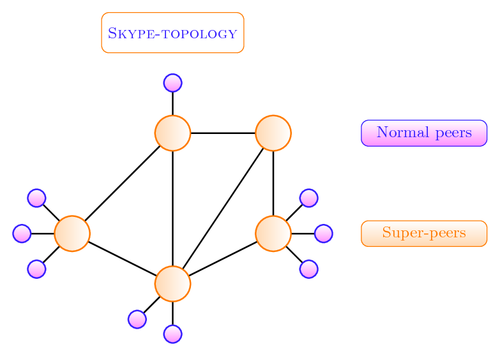 The way Skype used to work was that users could opt to be “super nodes”, which created a network layer that contained the IP addresses of users currently logged in and connected to that local super node. Whenever you, as a user, want to connect to another user, your Skype client will consult the network of super nodes, which in turn will locate the user and return the IP address back to your client. From then on, you and the person you wished to call could connect directly – in some cases super nodes would also route call traffic. Skype still works like this, however, Microsoft has taken over entire super node network – ordinary users can no longer become super nodes. Of course, the first thought of the paranoid people will be that this will give Microsoft a back door into Skype’s encryption, allowing easier access for government agents to intercept Skype calls. Just because you’re paranoid doesn’t mean they’re not out to get you! The potential of intercepts is not what I’m focussing on here though. Let’s flip over into the world of Windows Phone 7 – a version of Skype was needed to be rushed out as soon as possible, which it was. However, Windows Phone 7 has a limited form of multitasking. Applications can be held in a suspended state for a limited time, allowing you to switch back to them via the fast application switching function brought in with Windows Phone 7.5 Mango. For a Windows Phone 7 device to receive that incoming peer to peer call request, Skype would have to be constantly running in the forground, it could not work while tombstoned. If Microsoft were to tweak the way the Skype network works, then that incoming call request could trigger a push notification to a Windows Phone device via Microsoft’s Push Notification Service (MPNS). In turn, it might be possible for the incoming push notification to trigger something that would launch Skype to then receive the call. I don’t quite know if that’s currently possible, so would love for a WP7 developer to leave a comment on this. Of course, all of this is quite a radical change to the Skype network just to have it work better on Windows Phone 7. It is suspected that Skype support will be built into Windows Phone 8, and one might argue that Microsoft should just improve the way it does multitasking!